Orange County Wills Probate AttorneyWHAT IS A WILL? 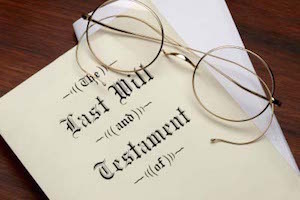 A Will is a written document which states to whom a person’s belongings, money and property are to be given upon death. A valid will may either be typed or handwritten (holographic). The person who makes the will is commonly referred to as the “Testator”. After he dies he is sometimes referred to as the “Decedent” in legal terminology. There are legal requirements to create a valid will so legal counsel is recommended to make sure the will is legally enforceable and so as to not lead to disputes and litigation. One common mistake is made in “do-it-yourself wills” is where the maker of the will does not mention one of his children in the will because he does not want to leave that child anything. The legal result is just the opposite. An omitted child will be entitled to his pro rata share of the estate because the law assumes that the will maker simply forgot that the child in question existed. The solution is to mention and simply leave the child he wants to disinherit a small amount of money such as $100. Probate is a California court procedure which is generally necessary to transfer ownership of property and accounts upon someone’s demise. In a probate court proceeding, the decedent’s will is filed with the court and a personal representative is appointed by the court and given authority to access the deceased’s bank accounts, pay bills and taxes and to transfer ownership to the heirs. There are some exceptions to needing probate in situations of smaller estates with bank accounts under certain amounts. The most widely used way to avoid probate proceeding is to establish a revocable living trust during one’s lifetime. Assets held in a revocable living trust avoid probate because the trust owns the assets and not the deceased person. The Probate Court system is not needed for transfer of assets of a properly prepared and fully funded living trust. Also, assets held in joint tenancy avoids probate because the surviving joint tenant gets 100% legal ownership. Joint tenancy has its pitfalls and must be fully understood before it is used. If a person dies without a will he/she is said to have died “intestate”. A probate court proceeding is generally necessary to administer the money and property of the deceased person and to distribute what is left after payment of debts and taxes to the heirs. The probate court proceeding for intestate estate is essentially the same as a proceeding for in a state where the person left a will. Where there is no Will directing to whom a deceased person’s money and property is to go, the state laws dealing with “intestate” succession must be followed. The laws are straightforward on the surface but can be complicated when it comes down to determining if particular accounts or properties are community property or separate property or quasi community property. Passing without a will can lead to estate chaos because various interpretations have to be made which in some instances can lead to expensive litigation. The two reasons for avoiding probate are the delays and the mandatory attorneys and executors fees. The entire probate process generally takes about a year and there are mandatory attorneys fees taken out of the estate which are 4% of the first $100,000 in value, 3% of the next $100,000, 2% of then next $800,000 and 1% of any amount above $1,000,000. In addition to mandatory attorneys fees there are mandatory executors fees. The fees on a $1,500,000 estate are $28,000. Typically people will select one of their children to be there executor in there will but also typically they may not be aware that the child selected will be entitled to the mandatory fees. Often, there is not nearly as much work involved in handling the probate, especially for the administrator. The practical way out of the mandatory fees is to establish a living trust prior to one’s death. The attorneys fees after death to administer a living trust are something that are negotiated between the successor trustees and the attorneys. Also, you can build into a living trust a restriction on successor trustees fees rather than leaving the amount of fees to chance. 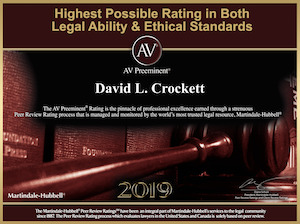 The law practice founder, David Crockett, is uniquely qualified to handle the complex and sophisticated range of issues involved with probate matters. Besides being an experienced probate lawyer, David has added degrees and skills so as to be the best possible probate expert for his clients. David is a CPA (Certified Public Accountant) with years of tax planning, tax return preparation for individuals, businesses. David is also a Licensed Real Estate Broker as most probate cases include real estate assets that need to be appraised, divided, sold and might have an impact of all parties from a tax prospective.